Who Puts the Ultimate Fun in the Funplex? Six months down, a lifetime to go. 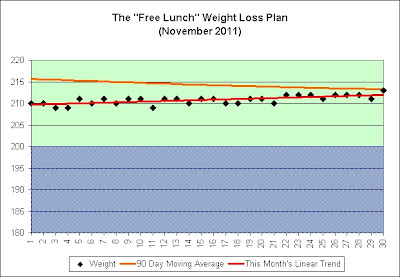 It might just be me, but I think I might see some leftover Halloween candy, Thanksgiving dinner, and Thanksgiving leftovers in the chart. The charts therefore are what they are. Winter is brutal (no yard work, fewer outdoor activities, and multiple food related holidays). 1. November is probably my worst month for weight loss. It's officially over. Further, I strongly suspect that this year's November wasn't as bad as last year's November. It will be interesting to me to see the seasonal variations as more data is collected. 2. I continue to climb the extra 20 flights of stairs each day. It adds up. 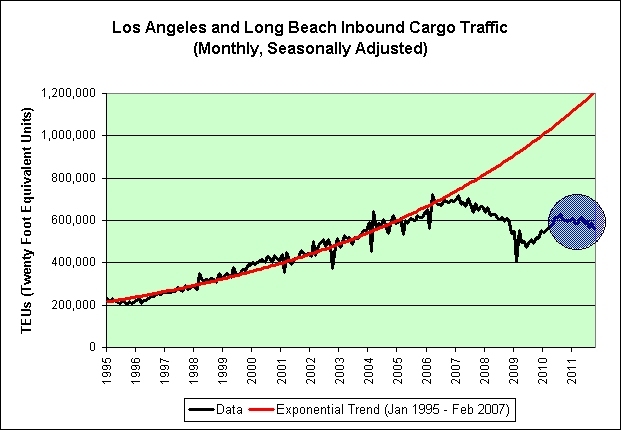 That's roughly 36,000 feet of additional climbing since the beginning of June. It is a firmly entrenched permanent habit. I will eventually make progress in the right direction again. It is simply a matter of patience. 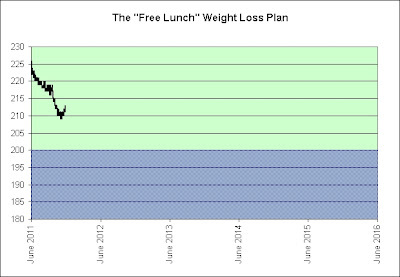 I originally thought it might take 3-4 years to get down to my goal. Perhaps that's still true. 3. The time needed to comfortably do the 20 flights of stairs continues to fall. I'm generally only taking 4-5 minutes per day now. I can always find time for that. It's no big deal at all (which is important since I am generally a lazy person looking to do the minimum necessary to meet my long-term goals). 4. I've also been doing some additional stair climbing on the side from time to time (although I never feel compelled to do so). On the 7th of November I climbed 200 flights of stairs all out (in addition to the 20 flights I always do). It took me 48 minutes and 47 seconds. That's actually fairly close to a personal best (done many years ago when I was younger and lighter). "This is the largest year-over-year gain in ShopperTrak's National Retail Sales Estimate for Black Friday since the 8.3 percent increase we saw between 2007 and 2006," ShopperTrak founder Bill Martin said in the statement." There was an 8.3% year-over-year increase on Black Friday in 2007. 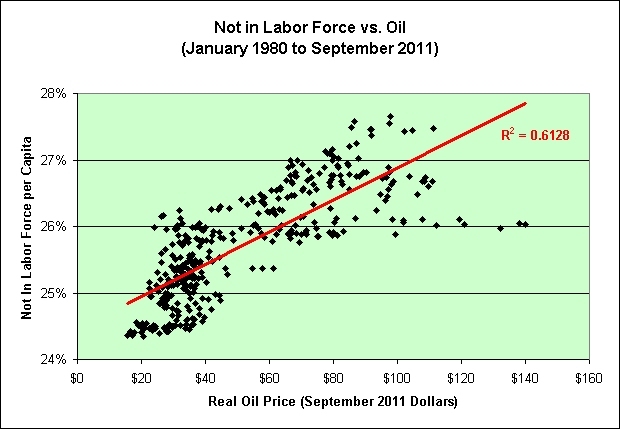 The WTI crude oil price was $98.24 on Black Friday in 2007. 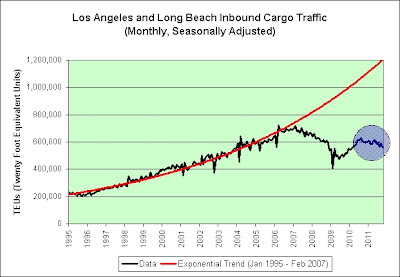 The Great Recession began in December 2007. There was a 6.6% year-over-year increase on Black Friday in 2011. The WTI crude oil futures price is currently $98.48. How Much Should Retirees Stake in TIPS? So assuming you've decided you'd like to include inflation-protected investments in your portfolio, what's the right amount? At first blush it might appear that you'd want all of your fixed-income portfolio in TIPS; that's the tack embraced by some academics and other investment theorists. At first blush I determined that I wanted my entire investment portfolio (not just the fixed-income part) in TIPS heading into the great recession (with some cash for liquidity on the side). I guess that puts me in the "other investment theorist" camp. After all, if there's a bond investment that helps offset the corrosive effects of inflation, why would you want to forgo it for one that doesn't offer that protection? In my opinion, the article should have ended right there (unless it was willing to explore the risks of owning bonds in general, which it was not). The key reason is diversification. While some corporate, foreign, and municipal bonds carry inflation protection, TIPS are the most widely available and liquid type of inflation-linked bonds, and most inflation-protected bond funds skew heavily or even entirely toward TIPS. 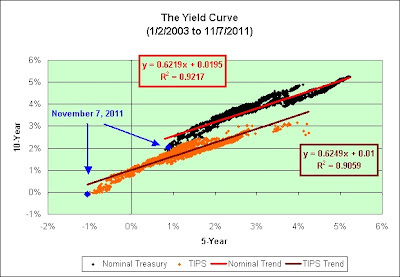 That means an investor in search of an all-inflation-protected fixed-income portfolio would have to go out of his way to avoid a heavy emphasis on government bonds; at the same time, he'd hold relatively less in corporate, asset-backed, and other bond types, which will outperform Treasuries and other government-backed bonds at various points in time. It has been my intent to go out of my way to embrace government bonds. No diversification was needed nor desired. That's not entirely true I guess. I very nearly backed up the truck on "asset-backed" bonds heading into the great asset crash but I flipped a coin and it came up tails. Whew! Crisis averted, lol. In all seriousness, I'm a retiree. I don't really care how the other bonds perform relative to TIPS (either better or worse). All I care about is that my investments keep up with inflation if bought in an auction and held to maturity. That's it. In the bond world, only TIPS can offer me that assurance (at least before taxes anyway). Put another way, if I was looking to maximize gains then I could always just drop the fire insurance on my home and hope for the best. Chances are good that I would be wealthier over the long-term. Unfortunately, hindsight could show that my house burned to the ground instead. The loss of my house through fire is not a risk I am willing to take. I would also point out that buying government bonds directly from the government means I don't have to pay excessive Wall Street middlemen fees and annual expenses. That really appeals to me. So the answer to the question about how much retirees should hold in TIPS falls somewhere between 0 and 100%. But where? Here's another way to put that. So the answer to the question about how much extra risk retirees should expose themselves to in order to potentially gain some extra reward is somewhere between 100% and 0%. As a retiree, I have chosen to expose myself to 0% extra risk and am willing to forgo any additional rewards and/or pain. I'm not suggesting that TIPS are completely safe. I'm simply arguing that they are most likely safer than the other options that Christine Benz is pushing. And finally, this is where the real fun begins. A version of this article appeared on July 21, 2011. On July 21, 2011 the 30-year TIPS rate was 1.64%. I put my entire IRA into one non-diversified 29-year TIPS bond at an even higher rate earlier this year. It is money I will be needing about 29 years from now. I wanted to lock in that rate. I did not want to take the extra risk that the rate would drop. I avoided diversification not out of greed, but rather out of safety. 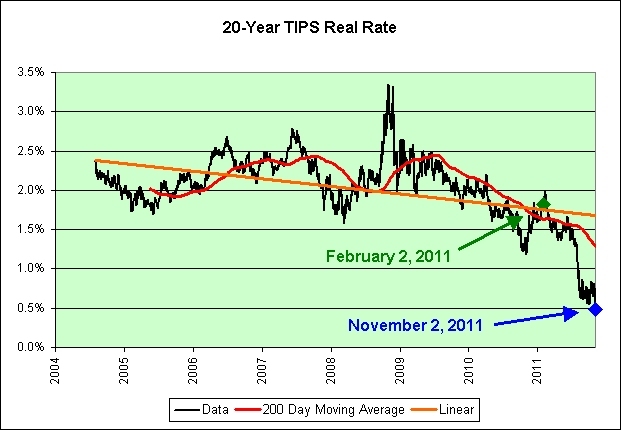 The 30-year TIPS now yields a mere 0.79%. Hindsight has not been at all kind to well-diversified second blushes. This is not investment advice. I'm simply offering up my thoughts as they relate to my particular portfolio and risk tolerances. Embracing risk in retirement just doesn't seem like a great plan to me (especially given the name of my blog). The instant classic of the day was a video of an Arkansas melee over a $2 waffle iron. The shaky, 48-second clip shows a mass of squealing and shouting men, women and children climbing over each other, grabbing and tossing boxes, with one woman seemingly unaware that her pants were sliding down her backside. "Oh my God!" a woman screamed in the only sentence discernible among the high-pitched shrieks. One person commenting on the video wrote: "The pinnacle of Western Civilization has arrived." Here's the original chart and the reasoning behind it. 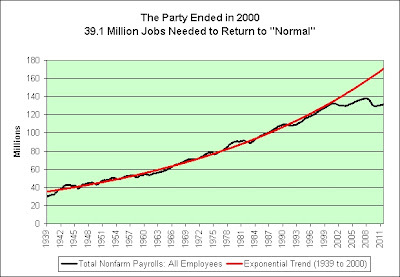 Here's where we are now (with a new projected trajectory). The following is an alternate path and one I would prefer if forced to make a prediction. 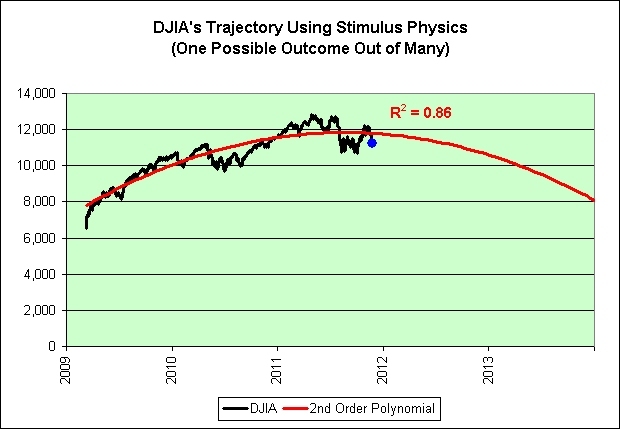 A flatlining outcome is fully consistent with a permanent Rubicon environment. You can pretty much guess that it is my personal favorite, if only to keep the ongoing Rubicon joke alive. The future's so bright, I gotta wear [rose-colored] shades. This update was requested by Fritz_O in the comments of the last post. The following economic theory comes from Bermuda Commercial Bank's treasurer Dan Commissiong. I've got to tell you. It's a whopper. To even the casual observer of the global economy it is painfully obvious that all is not well economically, both here in Bermuda and abroad. Daily economic headlines in our local newspapers and websites read almost verbatim with headlines found in overseas publications. News reports of economic dysfunction are rife, with almost daily reports of layoffs, bankruptcies, business relocations to other jurisdictions, intractable government budget deficits, falling asset prices, high levels of private indebtedness, and highly volatile capital markets. Throughout the western developed economies average middle class people are at a loss to explain what is happening to their living standards (in Greece especially I imagine), having never experienced this level of economic fallout before in their lives. Even elected political leaders and senior government finance officials in these countries are at loss to explain how their economies have managed to arrive at the precarious position they find themselves at today. 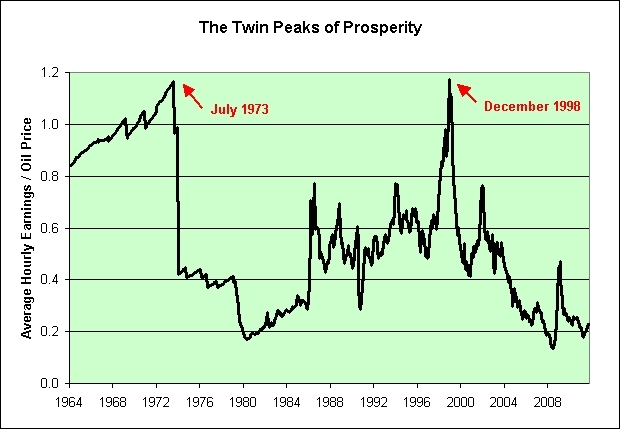 I believe that the best explanation is simply that a great deal of the prosperity experienced since the early 1980s was an economic illusion created by a global credit bubble that burst in 2008. The fallout from that burst is what's driving today's headlines of economic dysfunction. 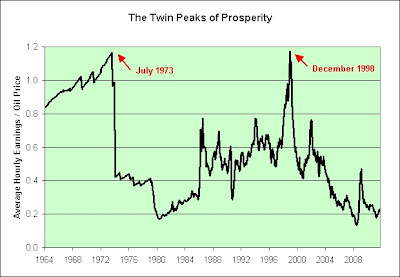 There's not a rational creature on this planet who would believe this illusion of prosperity theory. It's just crazy talk! That's not proof. My dog Honey irrationally believes everything I tell her. She's overflowing with magical thinking. We use ritual acts most often when there is little cost to them, when an outcome is uncertain or beyond our control, and when the stakes are high—hence my communion with the fuselage. People who truly trust in their rituals exhibit a phenomenon known as "illusion of control," the belief that they have more influence over the world than they actually do. And it's not a bad delusion to have—a sense of control encourages people to work harder than they might otherwise. In fact, a fully accurate assessment of your powers, a state known as "depressive realism," haunts people with clinical depression, who in general show less magical thinking. Fortunately, the public has access to advanced ritualistic free trading tools that help us in these uncertain times. It gives us a sense of control. It makes the average investor smarter than the average investor. And let's be perfectly clear here. We're talking tens of millions of retail investors doing hundreds of millions of online trades generating billions in revenue for tens of thousands of highly compensated financial executives. The stakes don't get much higher than that. I searched for "free trading tools" in Google and only got 2.34 million hits. 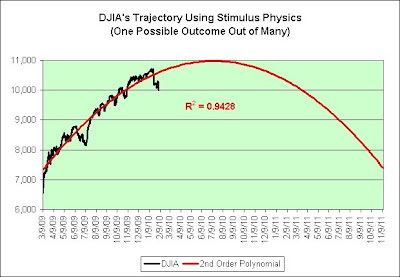 It's one of Wall Street's most closely guarded magical thinking secrets. Everyone can be a trend line master! It doesn't even require any information on the economy. How cool is that? It's not a coincidence that man's best friend has mastered the art of magical thinking. We stick with what works! Without magical thinking, we'd all be victims of a clinical great depression by now. There's nothing worse than depressive realism to ruin a perfectly good party. We're all thankful for this day. La la la la la la la la. Except for the turkey! The U.S. economy is improving, albeit at a lower rate, but a sluggish labor market, over-supply of restaurants in the industry, higher gasoline prices, food cost inflation, a still-elevated unemployment level and weak income growth may weigh on industry profitability. These factors may weigh on industry profitability? How can we know for sure! That got me to thinking. What actually would hurt industry profitability? Here's a list I just thought up. The list just sort of popped into my head. There's no explaining the vision that came to me with crystal clarity. I didn't even hold a séance. I only wish there was a way to match up my list with the Zacks Equity Research's list of current economic conditions which may (or may not) affect industry profitability. Only then could I know if my money was safe parked in a heavily weighted restaurant stock portfolio. Lacking that, I'm not about to do something impulsive based on seemingly well-grounded common sense conjecture though. You know why that is too. It's not like I really need to tell you. 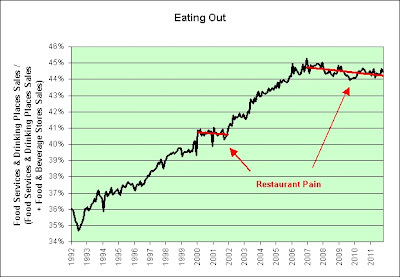 Restaurant stocks for the long run! Double the profits or bust! Scientific skeptics and atheists generally consider both religious and secular séances to be scams, or at least a form of pious fraud, citing a lack of empirical evidence. Nonsense! If there is one thing I know for sure, it is that there has been no fraud in America for at least as long as I have been alive. The subprime mortgage fiasco played out exactly as nature intended. Money was loaned to people with "no income, no job and no assets" and then we the taxpayers bailed out the banks to support the excessive bonus structure of well-compensated high-level financial executives. See? No fraud. That's just good old fashioned American business. I should have never allowed our dog Honey to study the European debt crisis. She entered the superbunker and there's just no getting her out. The S&P 500 closed below 1200? Again? How is this possible? November 21, 2011. A date which will live in infamy. The United States of America was repeatedly and deliberately attacked by the same deflationary debt forces as the Empire of Japan. We've also got $97 oil and a massive trade deficit with the world. Unlike Japan, we're therefore in a much better position to achieve sustainable growth and prosperity over the long-term. 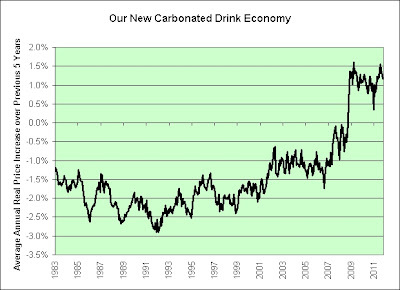 I've taken the consumer price index for carbonated drinks and adjusted it by the overall CPI. The chart shows the average real price increases over the previous 5 years. Here's why I was curious. I moved to Seattle in 1988. I remember thinking it was a really good sale if I could buy a 6-pack of Coca Cola for $1. When it reached that price, I backed up the truck. As recently as 2004, I remember thinking it was a really good sale if I could buy a 12-pack of Coca Cola for $2. When it reached that price, I backed up the truck. 16 years had passed but I was still buying Coca Cola at that same price. You can see the effect of that in the chart. Carbonated beverages were not keeping up with inflation. As seen in the chart, those days are over. My Coca Cola supplies have dwindled to nothing. It might very well stay that way. This week's sale is $3 for a 12-pack. I'll pass. We do have an ample supply of Dr. Pepper though (purchased at Costco recently with one of their in-store coupons). Coca Cola is really pushing their luck, at least with us. The company hopes its smaller, cheaper packages will appeal to consumers on tight budgets. Yeah, well, good luck on that one. Everyone on a tight budget should be thinking in terms of dollars per ounce. Smaller packages are generally not the way to save money. Stubborn people on tight budgets should look at Coca Cola's 27.59% profit margin during a period of high unemployment and decide for themselves if that is something they wish to support. I find myself drinking more Gatorade lately (Pepsi product). The container costs about $10 (at Costco and/or Sam's Club) and makes 9 gallons (the equivalent of eight 12-packs). It doesn't pack the calories and high-fructose corn syrup rush of a soft drink, but that's actually a good thing. Hey, at least we've got that going for us. The Treasury Inflation Protected Securities, or TIPS, were sold at a yield of 0.99 percent, compared with a forecast of 0.060 percent, the average estimate in a Bloomberg News survey of seven of the Federal Reserve’s 21 primary dealers that are required to bid on U.S. debt auctions. 0.99%? 0.099%? It's all good. At least it wasn't reported as 99% in honor of the Wharton School of Business. As for Wharton School of Business mocking, I'm reserving that for Jeremy Siegel of the Wharton School of Business and Mark Zandi who got his Ph.D. at the Wharton School of Business. 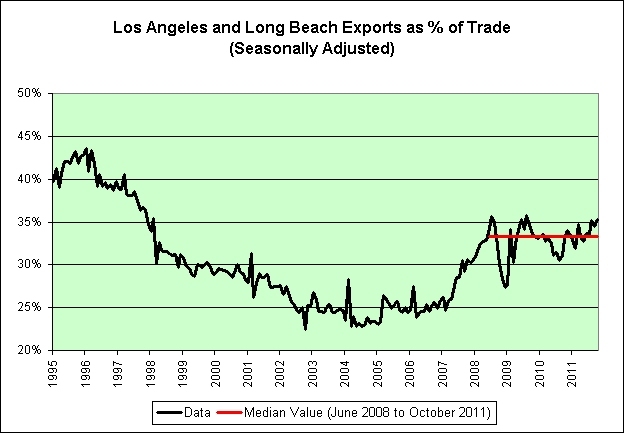 Exports have been stagnating for more than a year. 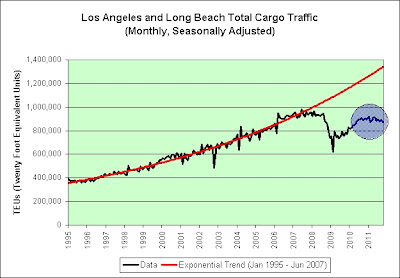 Exponentially increasing global trade? Game over. There is no meaningful dent in our unsustainable trade situation. 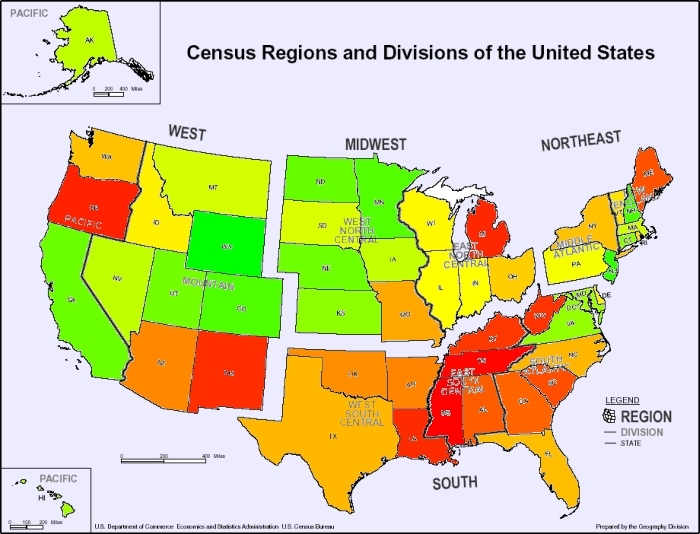 The data represents August 2011 participation rates (people participating divided by the state's population). It's a smooth scale from green to yellow to red. Pure green represents Wyoming's 6.3% participation rate. Pure red represents Mississippi's 20.0% participation rate. So here's the question of the day. 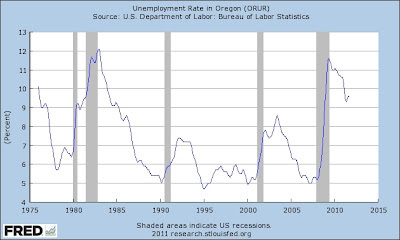 What's up with Oregon's 19.2% participation rate? PLEASE BRING CAKE AND CANDLES. The ultimate fun birthday cake is inedible? It makes sense if you think it through. Nothing says fun like a diamond encrusted birthday cake with solid gold filling! It is common knowledge that the ultimate fun can only be achieved by outgoing extroverted kids who have many friends. The staff at the funplex are not miracle workers. If your child is a shy introverted book reading type, sorry about that! The fun sure adds up! EVERYONE must wear SOCKS on inflatables!! Must remember to wear socks! Ultimate fun! Must remember not to wear socks! Ultimate fun! This post was inspired by the ultimate fun. It is an ongoing joke that never gets old to me. The first quote comes from the president of the division where I once worked. I saw it in a magazine. It needs a bit of back-story first though. We'd just gone through one of the biggest frauds in the history of the stock market (it was before Enron and Worldcom). It was on the front page of the Wall Street Journal for a good month. There had been layoffs. Morale was in the toilet. So what was the quote? I don't think I have ever laughed so hard. What the heck was "fun" doing in there once, much less twice? Hahaha! On to the second quote. I'm reminded of it quite often, especially when watching the financial news on TV. Fun! Creativity and fun! The lack of "fun" is clearly what the president of my division feared most, and for good reason. Dark gallows humor was the only fun we had. I'm reminded of one team walking by my door. They'd just been laid off. One said, "Dead men walking." We all laughed, but nervously. For the holidays, they had some vacancies. They filled two of them with what look like flea market venders. No decorations - cheap jewelry and cheap handbags. Otherwise we have a JCP, Belk's, Beall's and a couple of jewelry stores. Can you spell desperate? And I had noticed that JCP didn't seem to have anything new since about August in the windows - And just this week I saw that the new CEO is planning to turn the company around by creating an environment where employees are creative and engaged. Please. I've been around the block a time or two - not happening. That is just nonsense. Not that I know what is going to happen. The JCP CEO also said that sales of basic goods were weak this quarter because of less demand. Not exactly. I bought one item the last quarter - socks for my hubby. They cost the same as the previous socks but were half the quality. I was going to buy him pants too, but when I realized the fabric was half the thickness for the same price(he wears heavy duty cargo pants - construction work), I passed. So if it weren't for customer loyalty/ stupidity/ or something, sales of basic goods wouldn't have even been as high as they were. I am confident you'll post an appropriate video. It would seem that JC Penney's plan is a "cheap" trick. Consumers neither "want" nor "need" overpriced socks at half the quality? Who knew? I am a complete believer in the "good enough" revolution. I'm a former lead software engineer but I'm running a computer that was built seven years ago. It is still running Windows 2000! How's it working for me? Good enough! It doesn't just apply to computers though. I'm not seeing much improvement in aluminum foil, ziplock bags, garbage bags, toilet paper, paper towels, t-shirts, sweat pants, underwear, socks, sneakers, bath towels, and anything else I've bothered to hoard based on my ongoing concerns about future prosperity. I figured they are all "good enough", so why risk having to pay more for them in the future if inflation actually does pick up at some point? For what it is worth, I hoarded a lifetime supply of Gold Toe socks purchased at Wal-Mart a few years ago at prices far, far below what the JC Penneys of the world once charged me for the same product. My local Wal-Mart now no longer carries them. It was definitely one of my better purchases! Viva la revolución lo suficientemente buena! Italy has a smaller fiscal deficit than either Ireland or Spain, for example, so it will probably have less cost-cutting—with a less pronounced impact on economic growth. Here's a chart of Italy's stock market since the opportunities appeared. 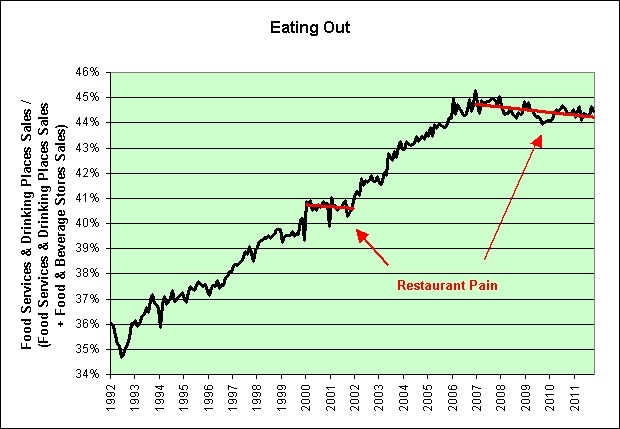 Eating out less and shopping in more? 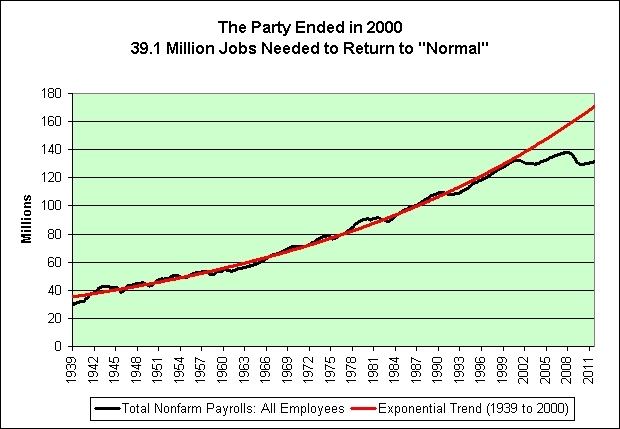 And we wonder why employment growth is weak? The government is officially asleep at the EE Savings Bond wheel. Although the government has set the short-term interest rate of EE Savings Bonds at just 0.6% it has not altered the original term (the time needed for the bond to double in price). That's still set at 20 years and if held that long the bond will yield 3.53% per year. 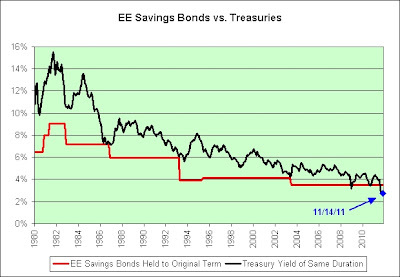 The chart above compares the EE Savings Bond rate if held to original term (the time needed for the bond to double in price) to the rate of a treasury bond with the same duration (using interpolation on the treasury yield curve where needed). 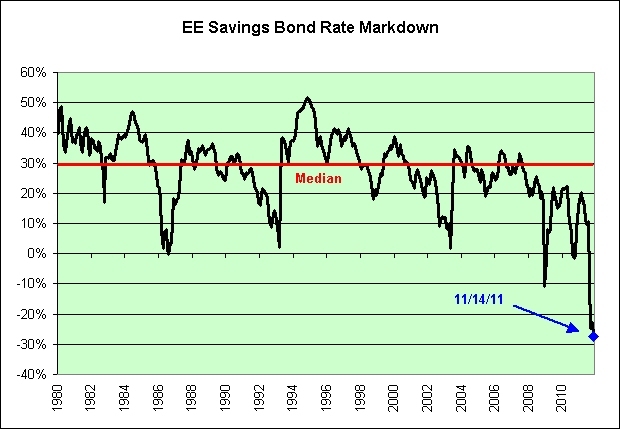 The chart above shows the rate markdown of the EE Savings Bond compared to a treasury bond of the same duration. That tends to be about 30%. Put another way, if the treasury bond yields 10% then the savings bond tends to yield about 7%. 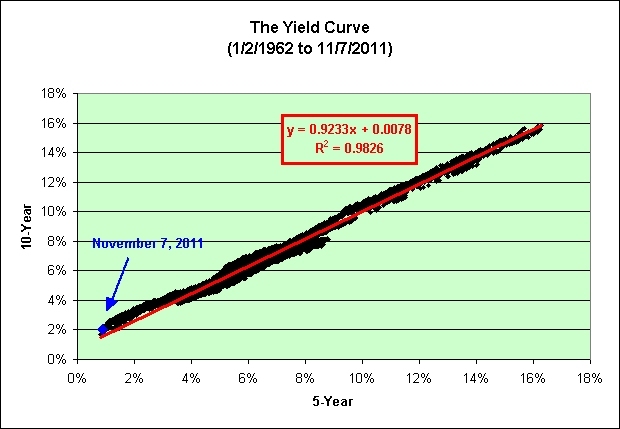 If the treasury bond yields 5% then the savings bond tends to yield about 3.5%. The lower rate is due to the tax advantages that EE Savings Bonds offer (deferral of taxation, tax benefits for education). As of today, the EE Savings Bond has an original term of 20 years. It therefore yields 3.53%. A 20-year treasury bond currently only yields 2.77%. As seen in the second chart, the mispricing between the two is currently at an extreme. What was once a premium to own EE Savings Bonds is now a discount. In theory, if trading fees and taxes were absent then one could make risk-free money for 20 years by shorting $5,000 in 20-year treasury bonds while simultaneously buying $5,000 in EE Savings Bonds. The government would basically be paying you each and and every year for the next 20 years to do the trade (much like what it is doing for our biggest banks). Or alternatively, I can't say that EE Savings Bonds are a good value to other things one could invest in, but it is clear that they are a good value relative to treasury bonds in general. 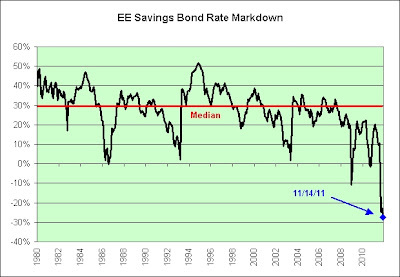 Since I am generally a fan of relative value, that means I will probably be a buyer of EE Savings Bonds in 2012. That will make the 3rd year in a row. Go figure. EE Savings bond rates and terms will not be changed again until May 1, 2012. There's no hurry to make the purchase though. In fact, it would probably be best to wait until April to make the decision. If the mispricing is gone in April it would only mean that interest rates on 20-year treasury bonds have risen dramatically. Who knows? It could happen. Something will eventually fix this mispricing. That's about all I am sure of. I expected at least some of it to be fixed on November 1, 2011. That chart sure rings a bell. That leads us to the following chart. And lastly, the musical tribute. The conventional wisdom goes something like this: Obesity rates are skyrocketing among the poorest Americans, therefore fast-food restaurants must be to blame. But a new study by a professor at UC Davis' medical school has found that it's Americans with salaries at the higher end of the spectrum -- in some cases as high as $80,000 to $90,000 -- who are driving fast-food consumption at the likes of McDonald's and Burger King. Too bad conventional wisdom isn't traded publicly. There have certainly been times when I wished to short it. He also noted that, although fast food has a reputation for being cheap, a steady fast-food diet is largely out of financial reach for the truly impoverished, especially those who need food stamps to get by. I'm once again reminded of the following insanity. Kelly Brownell, director of Yale's Rudd Center for Food Policy and Obesity, says encouraging more fast-food consumption is not good for people's health. "It's preposterous that a company like Yum! Brands would even be considered for inclusion in a program meant for supplemental nutrition." I'm all in favor of providing food for people who can't afford it, but do we really need to conveniently prepare unhealthy food for them and pad the profits of corporations too? Is that what the food stamp program should really be doing? I'm a fairly frugal person. I consider fast food to be a bit of a luxury. It is not cheap food. I have cut back on it as I try to conserve my nest egg's purchasing power. Perhaps most people on food stamps should be doing the same? Some might argue that homeless people on food stamps don't have an option. They need food prepared for them. All I can say is what I would do in their situation. I would get together with other homeless people and pool resources. One could make quite a feast out of a few loaves of bread, a large jar of peanut butter, a large jar of strawberry jam, a few pounds of bananas, and a gallon of milk. It certainly wouldn't be any less healthy and it would cost far, far less per person. I'd use the money saved to try to get out of the rut I was in so that it did not become permanent. I can't say that in this economy I would be successful, but at least I'd be trying. It would require some effort on my part. Unfortunately, effort goes against the ultimate policy of the welfare state. This is a continuation of a previous post with the data presented in a different way. The chart compares the yield of the 10-year Treasury to that of the total debt (total credit market debt owed) to GDP ratio. 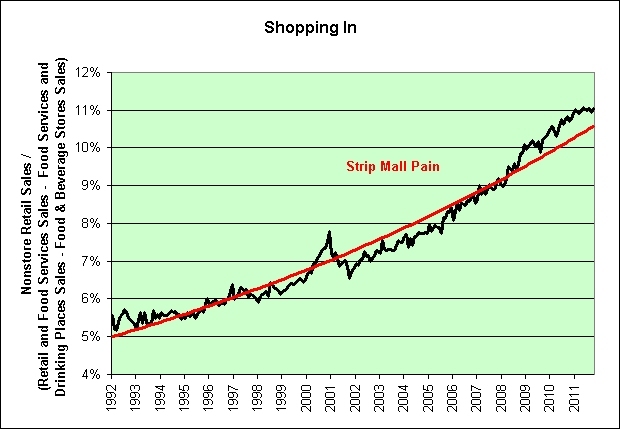 It would seem to be a good idea to stay below the red trend line whenever possible. We had no problem doing that before the 1980s. It was trivial. It has been more difficult in recent years. Here's some good news. If Japan is any indicator, it is amazing how much we can borrow if the interest rates are low enough. As of today, the 10-year Treasury yields just 2.00% . 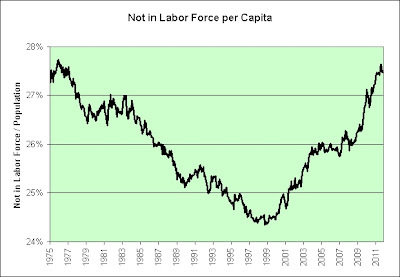 That's well below the trend line. It would also seem to be a good idea to stop moving to the right on the chart. We've actually done that and it is giving us some breathing room. 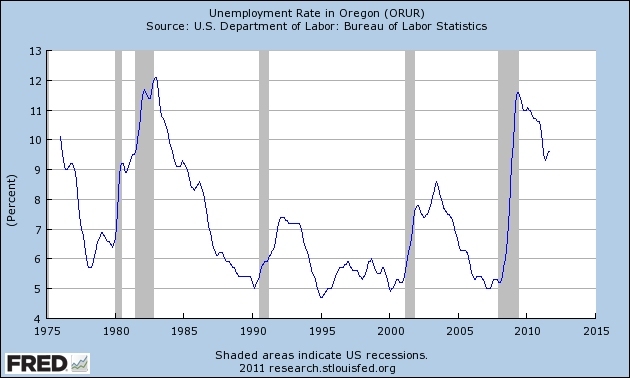 Let's just hope we don't have another recession shortly that would undo some of this good work. 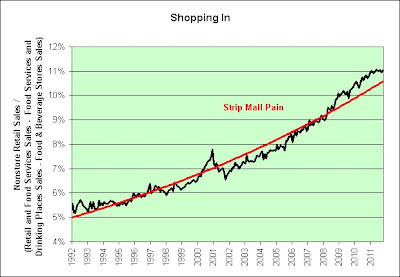 Knowing all we know now about the deflationary events (two major stock market crashes and one major housing market crash) over the past decade which do you think would have been the better investment in 2001? 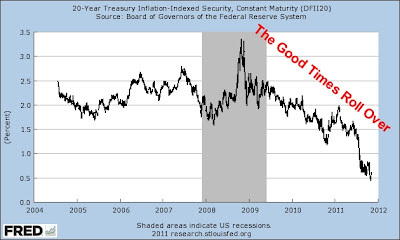 Treasuries with inflation protection or treasuries without? And the winner was... inflation protected treasuries (by a wide margin). I guess long-term inflation has a way of creeping up on us, even during deflationary times. It also means that TIPS investors were actually paid to take the inflation insurance. Go figure. That said, I am bracing for more deflation over the short-term and that mindset very nearly enticed me to alter my inflation protected investments. As last seen in August, it's not the first time. I thought long and hard about it again this morning. I even went so far as to place a sell order on the one long-term TIPS bond filling my IRA. Rates are down even more since I wrote that (prices are up). I placed the order an hour or so before the markets opened. I had a change of heart and cancelled the order though. I think it is the first time in my life that I felt greedy for thinking about taking profits (as opposed to feeling greedy for not taking profits). We may get another round of deflation and part of me wants to sell that one bond now and buy that very same one back later. That felt greedy. I decided it was and instead opted to continue with my original plan to hold it to maturity. Some would argue that moving to cash is the least greedy thing one can do. I'm not sure that is true. If one is moving to cash with anxious anticipation of a market crash while simultaneously having a plan to redeploy capital during the carnage then that would seem to be fairly greedy to me. In my opinion, that's market timing and casino mentality. I had it this morning. No doubt about it. It eventually all came down to this for me. If I am still willing to buy 0.0% I-Bonds for the long-term (and I am) then I should be willing to hold a long-term TIPS bond of similar maturity within my IRA that has an even higher rate. What an interesting day this has been. 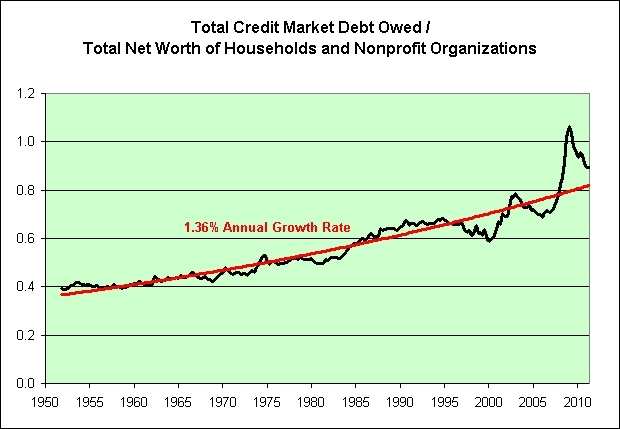 The black line is the GDP to total credit market debt owed ratio. 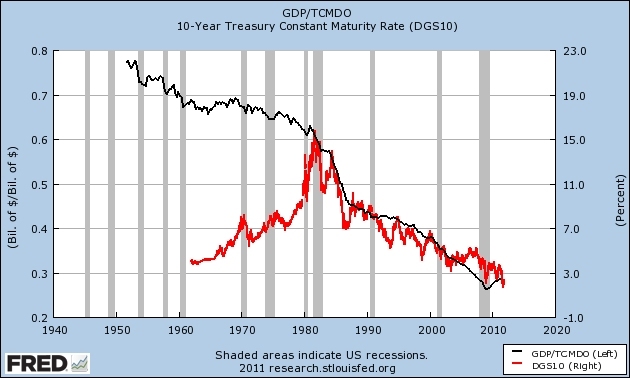 The red line is the yield of the 10-year treasury note. 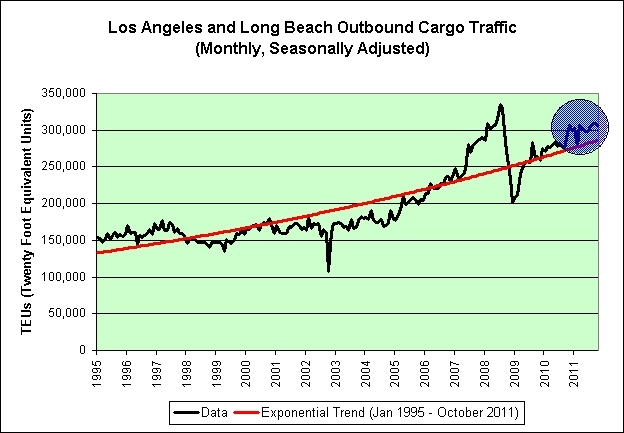 Who thinks the similar movements in both lines since 1980 are just a coincidence? 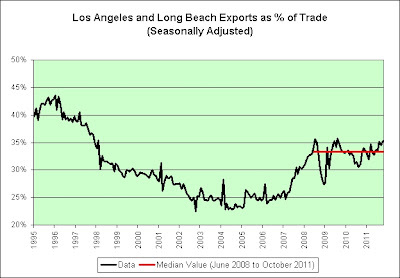 Check out where the red line was compared to the black line in 2006/2007. How did that work out in hindsight? Oops! 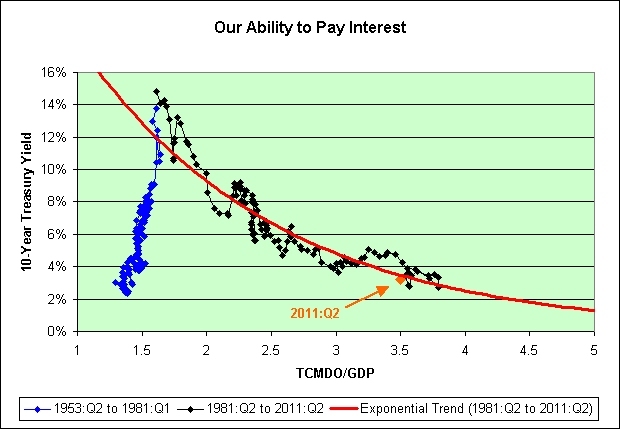 As seen in the chart, there was plenty of untapped ability to pay higher interest rates before 1980. We no longer have that luxury. If I am correct to think this way then those who expect a renewed bull market in stocks *AND* dramatically higher interest rates must be completely detached from the real world. "In our view, 7% is a 'tipping point' for any large debt-laden country and is the level at which Greece, Portugal and Ireland were forced to accept assistance," Rod Smyth of Riverfront Investment Group told clients in a note this week titled "Europe's attention turns to Italy." If you told me what the 5-year nominal treasury yield is then I would use the following chart to guess what the 10-year nominal treasury yield is. That said, things will get a bit muddy if we keep trying to fall off of the chart. 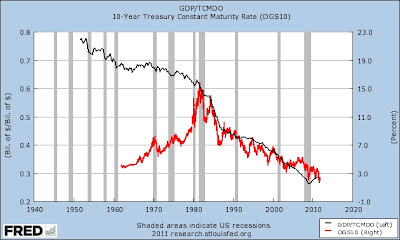 For example, if you were to tell me that the 5-year treasury yield was 0.0% then I would guess that the 10-year treasury yield would be 0.78% (see the formula in bright red). 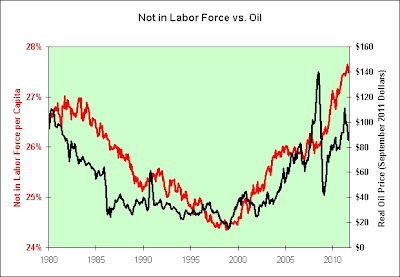 Using only the nominal treasury data from 2003 to today, I might be tempted to guess 1.95% instead (see the formula in bright red). Let's continue the guessing games. 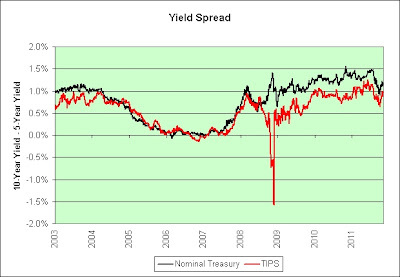 Using similar short-term data on TIPS (as seen in the chart above), if you told me that the real yield of the 5-year TIPS is 0.0% then I might guess that the 10-year TIPS would be 1.0% (see the formula in dark red). Said mostly tongue-in-cheek, when can we expect to return to such a prosperous era? Can't you just picture a world where a guaranteed 0.0% pre-tax 5-year return on capital was once again possible? Now let's turn our attention to the spreads directly. As seen in the chart, the spread between the 10-year treasury and the 5-year treasury is currently extremely high and was recently in record setting territory. Banks love a large spread. Borrow short, lend long. Will it continue? If it does not continue then how will it change? 1. Short-term rates could rise. That's not going to happen any time soon. Bernanke has all but promised that. 2. Long-term rates could fall as investors eventually capitulate and accept lower yields. 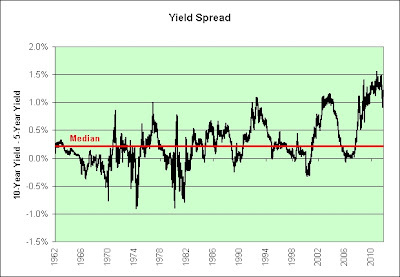 Think of it as an infection on spreads that spreads. Pun intended. It's a fun game! Think Japan! For what it is worth, I bet big on the latter earlier this year. No complaints so far. Here's a closer look at recent years. I've included the TIPS spread as well. That huge downward spike in the TIPS spread was due to the deflationary event in 2008. It could happen again (perhaps this very Christmas season). If so, I plan to ride it out again. 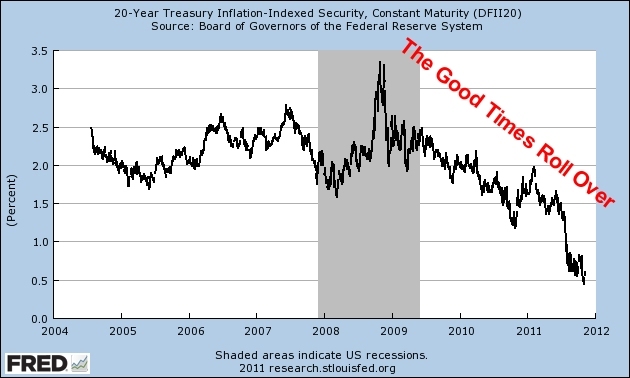 Please note the nearly perfectly anchored inflation expectations of the red and black lines heading into the deflationary event of 2008. 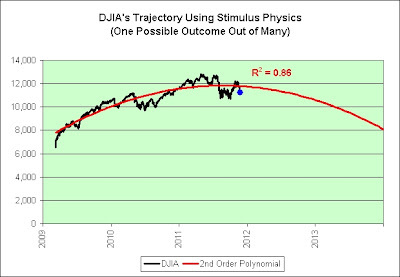 The lines do not directly represent inflation expectations but consider this. If the difference between 5-year TIPS and 10-year TIPS is identical to the difference between 5-year nominal treasuries and 10-year treasuries then none of the extra yield in longer term maturities was probably due to inflation expectations. None of it. It must therefore be other things, such as opportunity cost and liquidity risks. 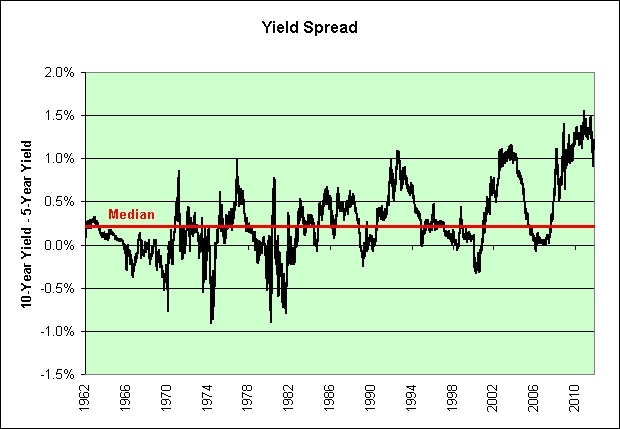 This chart also proves that the bond market is not omniscient. It was completely and utterly blindsided by deflation, much like the stock market was. Trust it to predict the future inflation rate at your own peril. Disclosure: The vast majority of my nest egg sits in TIPS and I-Bond ladders bought directly from the government, held to maturity, and with a decidedly long-term bias (to hopefully meet my long-term needs). 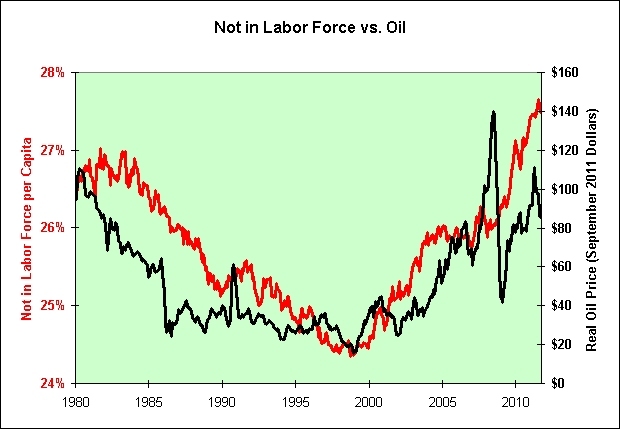 The following chart shows how many barrels of oil the typical production and nonsupervisory employee earns per hour. It might be best to start building one. System-wide comparable store sales increased 1.0%. 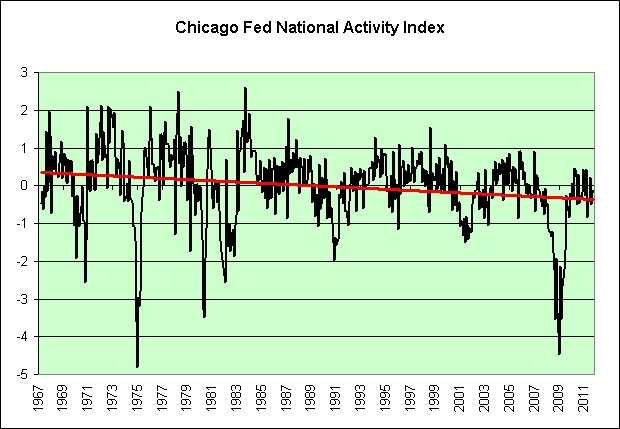 The CPI averaged 218.254 in 2010:Q3. 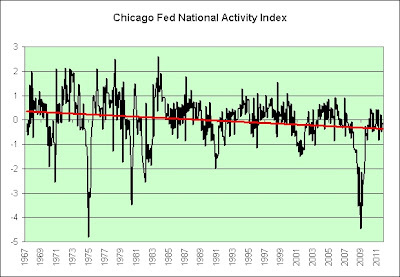 The CPI averaged 226.452 in 2011:Q3. That's an increase of 3.7%. Inflation adjusted system-wide comparable store sales therefore fell 2.7%. Don't even get me started on what happened to net income. Net income available to common stockholders of $2.8 million, or $0.17 per diluted share, compared to $3.6 million, or $0.21 per diluted share. So what did the shares do today? Up 3.94% of course. WASHINGTON (AP) -- Federal Reserve Chairman Ben Bernanke on Wednesday acknowledged that the pace of economic growth is likely to be "frustratingly slow," after the Fed downgraded its forecast for the next two years. MaxedOutMama found an article that she felt would interest me from a sarcastic perspective. I can't imagine why. It makes perfect sense to me. Something is wrong when keeping cash in the kitchen cookie jar seems a reasonable substitute for your bank. It may feel rebellious -- your own little Occupy Wall Street act of defiance -- and even a bit savvy, given those checking-account fees, ATM fees, and monthly debit-account fees. Agreed. It does seem a bit rebellious and savvy to avoid fees by cutting out the middleman. In fact, I get that same feeling each time I buy TIPS and I-Bonds directly from the government for free. What a rush! That little depository institution atop your kitchen counter has big drawbacks, however, including a lack of federal deposit insurance, zero interest, and ease of access that could prove dangerous to your financial health. Agreed. One must carefully consider the drawbacks. Let's tackle them one at a time. We absolutely need the deposit insurance because there may come a time when we go to cookie jar and the cash isn't there. Without some sort of insurance, what would happen if we loaned out the money to questionable relatives as part of a "sure thing" get rich quick scheme? What would we do if they can't pay us back? I'm assuming of course that we are offering NINJA loans based on our love of action movies. Ninjas rock! I'm also assuming that we aren't too big to fail of course. We clearly wouldn't need the insurance if the money was missing from the cookie jar but the government took it from other peoples' cookie jars to refill ours. This is a huge deal. My bank currently pays me 0.05% interest on my checking account. That means that if I keep $10,000 in the bank then I will earn a whopping $5 per year. I can use this $5 to fill my gas tank so that I can visit the bank any time I like, presumably to use its drive-through ATM to get some of my cash. How cool is that? In sharp contrast, my cookie jar pays no interest though. I therefore can't use the money it generates to fill my gas tank. I'm also forced to walk to the cookie jar. Forced I tell you! This is America! At 51 cents per mile, we should be driving everywhere! And lastly, I have the privilege and right to hoard paper money promises in my bank so I can earn 0.05% interest. It is not something I take lightly. I'm fairly certain it is part of the Constitution, and if it isn't then it should be! It's just way too easy to get money out of the cookie jar. What I really need are hurdles between me and my money. I've tried rat traps put in there with it but apparently my greedy fingers can outsmart them. That's why I keep money in a bank. What I really need though is the ultimate hurdle. Picture a note affixed to all the branches of my bank. I'm not talking one of those impersonal form-letter bank closure notes. I demand something more cryptic! What the @#$% does that mean? Why is it in fine print like that? Is this legal? Is my money okay? Does anyone really care? Imagine the joy as I push the door of my darkened local branch and it does not budge. The note says it all. Something really good must have happened. I no longer have easy access to my money! O frabjous day! Callooh! Callay! Like the mome raths, I am indeed most outgrabed! I predicted 0.0% and 3.06% for the I-Bond. 0.0% was an easy prediction and the 3.06% part was just the math to go with that prediction. I predicted 0.3% for the EE-Bond. 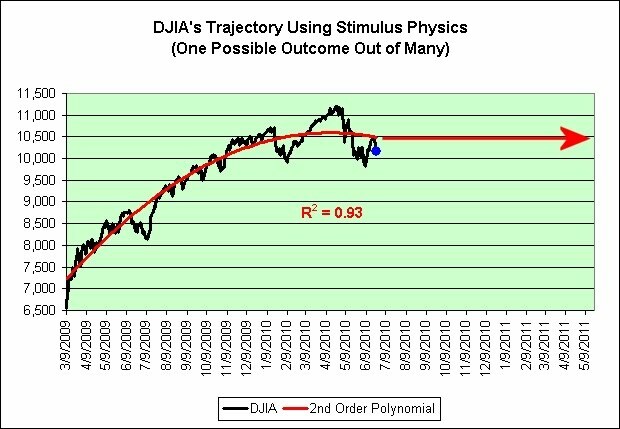 This was the far more difficult of the two predictions because it required extrapolating noisy data into uncharted territory. The EE-Bond rate was set at 0.6% on November 1, 2011. The yield of the 10-year Treasury Note was 2.01% on that day (today). 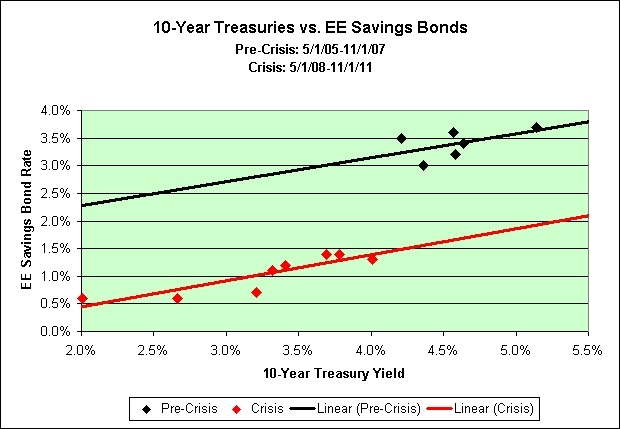 The EE-Bond rate was also set at 0.6% on November 1, 2010. The yield of the 10-year Treasury Note was 2.63% on that day. Note that the interest rate fell 0.62% on the 10-year Treasury Note but the EE-Bond rate is the same. They clearly have plenty of discretion when setting the rates. 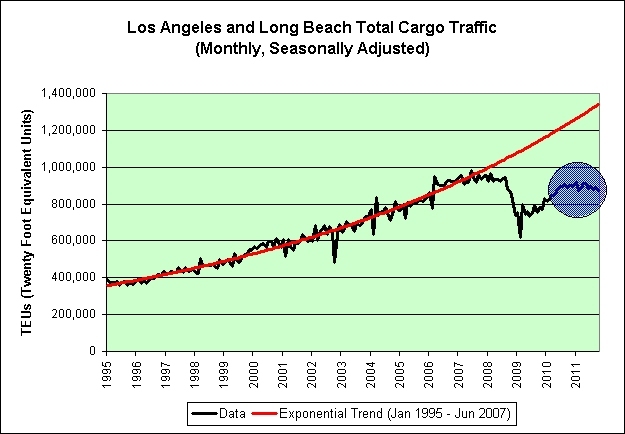 Also note the behavior change from pre-crisis to crisis in the following chart. That's clearly a huge discretion. 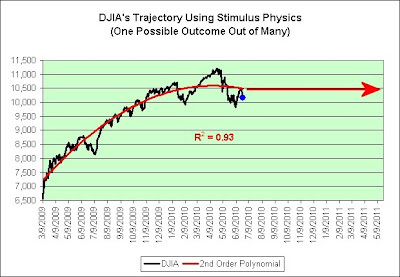 The 0.6% rate offered today has "twisted" the red trend line to more closely match the slope of the black trend line. It would therefore be hard to argue that this increase in the rate over what I expected is an indication that we are out of crisis mode. 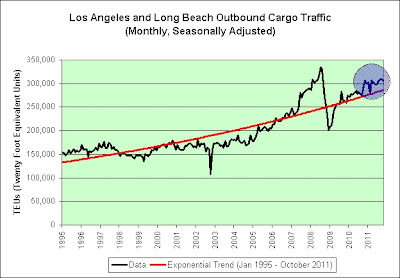 In my opinion, it is simply an indication that the data is/was a bit noisy (doesn't stick firmly to the trend lines). In any event, this new data point should help me make more accurate predictions in the future. I'm even willing to make my first prediction right now. It is my opinion that we will still be in "crisis mode" 6 months from now. 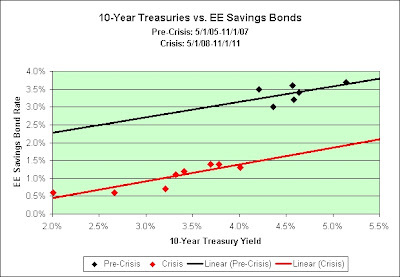 In other words, the EE-Bond rate set on May 1, 2012 will be much closer to the red line than the black line. Why such a bearish mood? Here comes the sarcasm. The more we borrow, the more we're saved!